The last page titled Weird Science got me thinking about comet 67P. When ESA and the world first saw 67P we were amazed by its shape, maybe we'd see a potato shape or a pear or some kind of ball but two distinct lobes, it was fascinating. ESA answered the question as to why 67P has this shape. Two separate bodies conjoined with different alignments of the strata of ice and dust. Their strata or layers aligned in differing orientations as these two distinct objects coalesced around a low pressure zone in space. Meaning these two separate bodies came together gently enough to remain in tact, connect and stay connected. Click image to download a full version. Our moon model, an object uniquely collided with earth and spread expanding debris outward which coalesced into our moon and is still expanding outward at 4 inches per year. This is not the norm matter fact its the only example of this in the solar system. If two objects in space have mass they will attract. 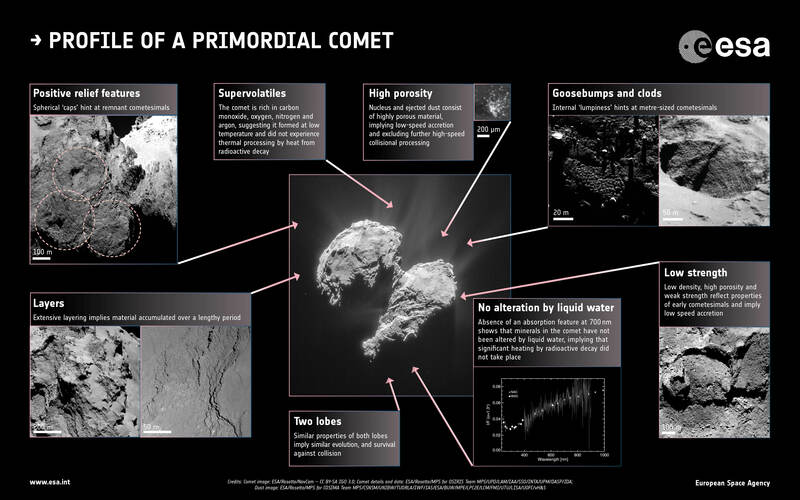 This is why 67P is composed of two distinct objects producing its shape. Pluto and Charon have been in their orbital dance for a long long time and what they are doing is embracing as they come closer and closer seeking to join around that barycenter of low pressure in space. Pluto and Charon have never collided but they probably will and I don't see it as some massive catastrophic event. Sure there's going to be some chaos like two spicy Latino dancers embracing passionately on the floor as they spin and twirl, They will merge slowly enough to become like comet 67P. I have developed a new theory that explains how Pluto/Charon got tilted 120 degrees and it's much more reasonable and likely than the impact theory. Page 41. Unlike 67P they wont be in close proximity to the sun their gasses will stay in tact and frozen but softened like we see currently at Sputnik Planum from shock waves which stimulate their amazing geology. They will continue their growth process conjoining while more matter fills this low pressure point in space.